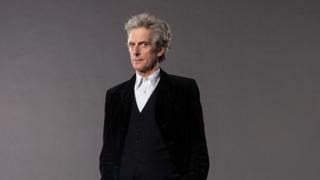 Image caption In the handwritten letter, Peter Capaldi said regeneration "is a bit icky"
Actor Peter Capaldi has written a special Christmas letter to a nine-year-old fan to reassure him about his Doctor Who character's regeneration. Capaldi wrote to David McGilloway, from Londonderry, to ease his worries about the regeneration process. In the handwritten letter, he said regeneration "is a bit icky," and like "having a bad flu". But he added it works out "well in the end". Glasgow-born star Capaldi has played the role of Doctor Who since 2013. He bowed out on Christmas Day when his character regenerated to become the new - and first female - Doctor, played by Broadchurch star Jodie Whittaker. Nine-year old superfan David said the letter, which arrived via Santa, left him "speechless and so surprised". "The letter was just so magical, the envelope it came in, Peter Capaldi drew a Dalek on it and it said my name on it," he added. David's older brother Tom also received a letter from the Doctor. Dad Brian, a teacher and author, said Santa may have got the idea to ask Capaldi to write the letter from a chance encounter he had with former Doctor Who, Christopher Eccleston, when he was filming in Belfast. He said Capaldi's letters were a magical Christmas present for the boys. "It was such a lovely thing for him to have done, I don't know how Santa managed to do it. "He (Capaldi) has taken a lot of time and effort, it is such a generous and kind thing to have done." In the letter, Capaldi also reassured David that the old Doctors never really go away, "they are always there in time and space". He wrote: "It's like the Doctor says, everything ends and it's always sad. But everything begins again, and that's always happy. Be happy. Doctor Who was first broadcast in 1963 and had a relaunch in 2005. Capaldi replaced Matt Smith as the Doctor - whose ability to regenerate has allowed a number of actors to play the role - four years ago.